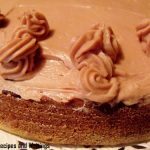 Today’s special guest is Amber who blogs are Mama’s Blissful Bites. Amber is an amazing lady who blogs about such a variety of things. She does recipes, crafts, green living, videos called “Ask Mama”, and does a “for Moms Only” section as well. She whips up amazing recipes like Chewy Coconut Oatmeal Cookies with Chocolate Chips, Chocolate Peanut Butter Squares, Pasta with Roasted Asparagus and Cherry Tomatoes, Grilled Cheese with Apple and Rosemary Walnut Butter, and The American Smoothie. She is incredibly talented and I feel so lucky she agreed to guest post for me today. I feel an affinity to Amber since I’m also a stay at home mom. It’s a challenging and rewarding job, one I see Amber does not take lightly. She raises the bar by going the above and beyond in an effort to not only raise her kids but teach them life lessons. I admire her for her outlook and positive attitude in life. You folks will love this lady as much as I do. Please welcome Amber to the asylum. Okay, (clearing my throat and pulling back my hair, I’m now ready.) I’m Amber from Mama’s Blissful Bites or also known as Mama when my kids are whining to get something from me. Whine. Whine. Whine. Because of my wonderful kids, I have put together a mom blog to keep other moms sane unlike the days I have. I started to watch the three year old pushing my two year old, fighting over toys, yelling at what movie to watch, stealing each others food, etc. I’m pretty sure my brain has fallen out quite a few times, but hey, so far I have made it. I’m a stay-at-home mom, blogger and home company sales woman. I have many trades but my kids are my favorite challenge of all. 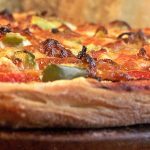 I blog about almost anything from being environmentally green to projects at home with the kids (to my favorite) recipes! I love to have my kids in the kitchen and learn about eating healthy and then making a dessert that’s not so healthy. I call it balance. Food is really the heart of our home. Sometimes even before the kids…maybe….maybe not….then again…maybe it is! As I was growing up, my mom always taught us the importance of placing a family meal on the dinner table. We always ate every night around the table. Then we always chatted about how she made the food. How this that or the other tasted phenomenal. Well, I couldn’t resist teaching my kids about what a home cooked meal is all about but things started to get complicated. I would fill up a pot of water and ask the kids not to jump on the sofa or add a jar of sauce to the pot and have one eye on my daughter trying to climb up the entertainment center. Yup, the two year old gymnast. No lie. I would serve these processed meals that they didn’t want to eat (they don’t have the taste buds for chicken tenders or even mac and cheese, I’m sobbing! Sometimes this girl needs something quick!) So I realized bringing them into the kitchen was far easier and messier. We have lots of fun in the kitchen. This is a great recipe for a young child who may not be able to do all the nifty things that you can in the kitchen. Just prep and go! Hope you enjoy as much as my family (friends and neighbors do) the Energy Ball or as my neighbor calls it, Date Balls. 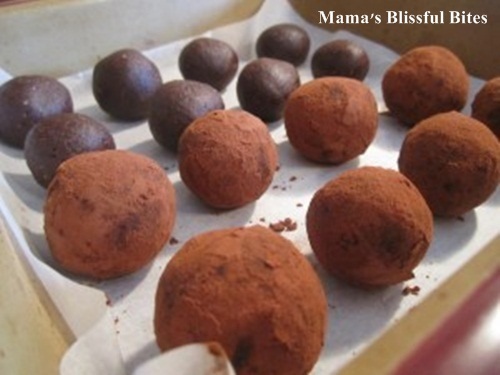 A wonderful and healthy snack option by Mama's Blissful Bites! Add cocoa powder, cinnamon, and vanilla and blend for another 20 seconds. Slowly add water until forms a wet ball. Roll into small balls. (My favorite part! I love getting messy!) 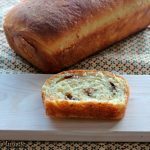 You can even roll in extra cinnamon, chocolate or even shredded coconut! They are filling and delicious! I left some half plain (my kids favorite) and the other half, rolled in cocoa. I sooo wish I had shredded coconut on hand, tisk! tisk! Place in fridge for thirty minutes and then dive in. 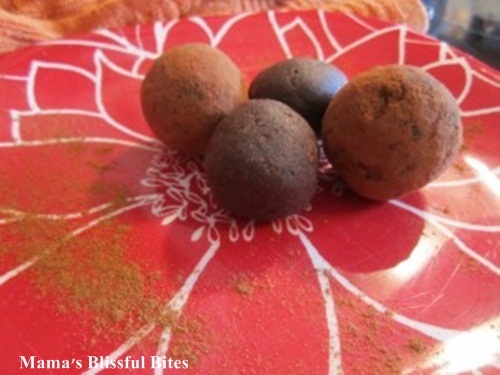 They are good for you, they taste great and the kids think they are "chocolate balls!" I'm laughing....wahaha. I love when I can get one over on them! 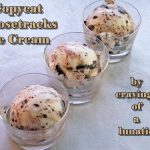 Thank you for letting me share one of my favorite snack/dessert recipes with you. I hope you all enjoy it and get in the kitchen! There are way too many great recipes not to make and bake! Thank you so much to Amber for guest posting for me today and bringing such amazing treats for everyone. I adore dates. I used to steal them one by one out of the package my dad used to stash for the odd time he baked with them. He would go to grab them and the package would be empty. They bring back such fond memories of childhood for me so a special thanks to Amber for making me nostalgic. 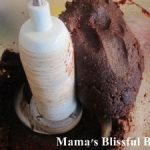 Make sure you stop by Amber’s blog, Mama’s Blissful Bites to follow her. You want to make sure you sign up for rss or email subscriptions so you get her recipes and mommy wisdom every single day. You will thank me, trust me. You can also follow Amber on Facebook, Twitter and Pinterest. I suggest stalking her everywhere. Us bloggers like a good stalk. The more places you follow us the better. So today is B-Dudes official move in day. Hopefully we’re cleaning and moving in his stuff right now. He rented a cute little apartment in the heart of the city. I just hope it’s big enough for him. I remember the days of renting a bachelor apartment. It’s hard to find room for everything and sleeping where you live and work can be a challenge. I told him to put his name on the list for 1 bedrooms so if one opens up he can always switch. We’ll see how it goes. I’ll be sure to take some pics to share with you folks. It feels so weird to think he’ll be all alone. I’d love to find him a kitten while we’re there. Something to keep him company. Plus chicks dig kittens so might make him some new friends right. See, the mama’s always thinking. Wait, did I just say I wanted to get my son a kitten to help him find dates??? Good lord, no wonder he wanted to move away. His mom is clearly nuts. Blog swapping with Deelicious Sweets! 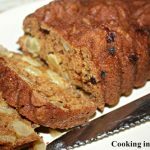 Check out her amazing Apple Cranberry Quick Bread! Don’t they just look amazing. I want to try them so bad. I love this idea because these would be great for when I’m on the go running errands and my 4-year-old daughter gets hungry. Thanks for the idea, Amber! Would work perfectly for a 4 year old. She’d love them. 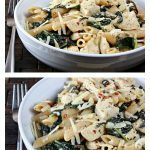 Fun recipe! Lots of flavor and nutrition in those little balls! Blissful, yes? 😉 Thanks for this. I want to try these so badly. You could have so much fun with the combinations. These energy balls are right up my alley. I make similar healthy snacks each week for our morning teas. These look great. Would be perfect with morning tea. Great idea. Thanks Ramona. It turned into a trip of doom at the end but until then it was fun. Me too. They look so good.